What is real-time bus tracking? Real-time bus tracking is a web-based tool that uses to GPS data to predict the arrival time of your bus. It’s part of Oakville Transit’s Intelligent Transportation System (ITS) that makes riding the bus easier and more accessible for everyone. Please note: estimated arrival times are only available for buses arriving within 30 minutes. How can I access real-time bus information? 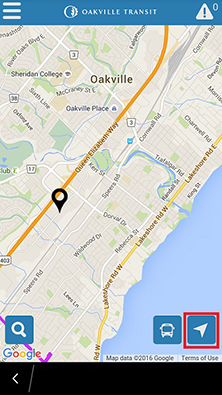 Visit oakvilletransit.ca and select Real-time bus tracking, and select Bus Finder. Tip: Create a Bus Finder account to subscribe to service alerts and bus arrival notifications. 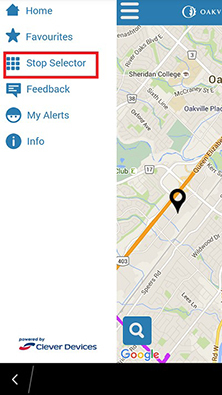 For iOS: Search for “Oakville Transit” in the App Store or download for iOS. 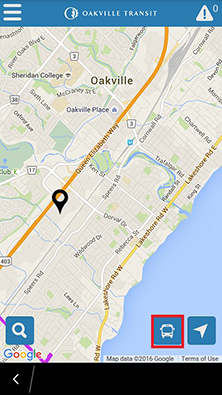 For Android: Search for “Oakville Transit” in the Google Play Store or download for Android. Tip: The “stops near me” feature shows all stops within 450 metres of your current location. Tip: Find your bus stop number by tapping the bus stop on the map in Bus Finder or from the Oakville Transit app. Bus stop numbers are also located on bus stop signs. If my bus is delayed, will the arrival prediction still be accurate? Delays due to road detours, traffic incidents, construction, weather or equipment problems may affect the accuracy of estimated arrival times. If your bus is delayed, estimated arrival times will automatically adjust accordingly. For example, if your bus is estimated to arrive in 10 minutes but is delayed by a traffic incident, the estimated arrival time of 10 minutes will stay the same until the bus begins moving again. What if I need to connect to another transit agency? Bus Finder and the Oakville Transit mobile app are designed for Oakville Transit service only.They do not include service information for neighbouring transit agencies (Mississauga/Burlington). To plan a trip that involves connections to other transit services, please visit Triplinx. How can I find the actual arrival time of my bus? Select “bus times” and type in your stop number and select “find” to display bus arrival information for that stop. If you do not know your bus stop number, choose your route, direction and stop description from the drop down boxes. You can then record your bus stop number for future reference. How do I find the location of my bus? Select the desired route on the “Bus map” button. The route that has been selected will be highlighted and will show the current location of the bus. How do I find the closest bus stop to my location? Select the “Bus map” button and choose the desired route to display the stops along that route. How do I receive service alerts and arrival notifications? Select the “Subscribe” button to set up an account.Once you have an account you can set up alerts based on the specific criteria you provide. Just select your stop, the time you want the alert to arrive, and check if you want it to come via email and/or text message. You can go into your account at any time to add, delete or edit your alerts. Note: standard text charges may apply. How do I use the Estimated Arrival Times Window? There are help files within Bus Finder. Visit the How do I use the Estimated Arrival Times Window? page to learn more. How do I use the Vehicle Location Map? Visit the How do I use the Vehicle Location Map? page. Which Internet browsers are recommended for Bus Finder? I’m still having problems. How do I report them? Contact Oakville Transit at 905-815-2020 Monday to Friday between8:30 a.m.and 4:30 p.m.or email transit@oakville.ca. How do I download the Oakville Transit app? For Android: Search for “Oakville Transit in the Google Play Store or download for Android. There are several Oakville Transit apps. How do I know which one to choose? Select the desired route. The route that has been selected will be highlighted and will show the current location of the bus. Choose “My Alerts” from the menu to set up an account. Once you have an account you can set up alerts based on the specific criteria you provide. Just select your stop, the time you want the alert to arrive, and check if you want it to come via email and/or text message. You can go in any time to add, delete or edit your alerts. Note: standard text charges may apply. How do I find a stop using the app? Use the search function to enter the stop name (e.g. Trafalgar Rd + White Oaks Blvd) or the stop number (e.g. 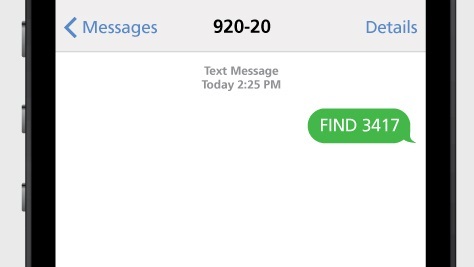 3003). A stop can also be located by using the “Stop Selector” feature within the app. How do I save or add a stop as my favourite? Use the app’s “Favourites” feature. Select the stop you want to be saved as a favourite and then select the star that is above the estimated arrival times. A star will appear beside the route name and number. Tap on the star to add the stop to your favourites. How do I remove routes that I’ve selected? Routes can be removed by selecting the Route button found on the map. A list of all routes will appear. Select the route you want to remove. You can also select the “Remove All” button to remove all the selected routes at once. If this does not work, you may need to refresh the page and try again. What version of Android/iOS is recommended for the app? I can’t return to the map. Tap on “Home” in the left menu. I can’t see any stops on the map. Tap on the bus icon and make sure “Stops” is selected. I can’t see any buses on the map. Tap on the bus icon and make sure “Buses” is selected. I can’t see any routes on the map. Tap on the bus icon and make sure “Routes” is selected. I can’t see any predictions for my bus. Predictions for buses are only shown when the bus is within 30 minutes from arriving. I’m getting this message: “you must have geolocation enabled to and be within the boundaries outlined by Oakville Transit to use this feature." Go to location and select "while using the app"